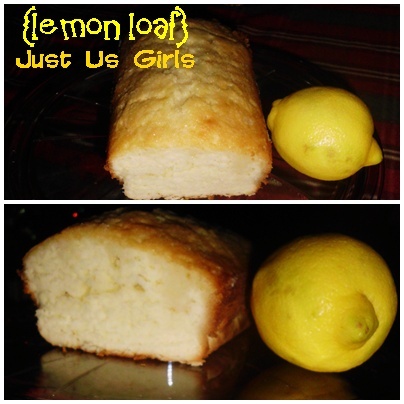 When I was younger my Bigmama (grandma) always made this lemon pound cake. It was moist, sweet, a bit sour and absolutely delicious. One of my many favorites from her recipe book. Unfortunately once she past away out of all the recipes that was the one that was never found. I mean, we all know how to make her pound cake, but she had a specific way of making her lemon icing she would pour over the cake. I remember asking my mom, all my aunts, no one seemed to know what happened to it or what exactly went into making the icing. So here I am, ten years since the passing of my Bigmama and still craving for her Lemon pound cake when I came across an amazing recipe from A Pretty Life in the Suburbs. As soon as I read how she made her icing and how she poured it over her loaf, I just had to make it. Man, do I love bloggers. It turned out great. The cake was moist, sweet, a bit sour and absolutely delicious. It's no pound cake and it's certainly not my Bigmama's lemon icing, but believe me, for someone who has been searching and asking about this recipe for the last ten years, this is perfect in my book and hit the spot. It seriously was very hard for me not to eat the entire loaf before the kids or the hubby came home. So check out this recipe, make it, let me know if you do and tell me how it turns out. Add 1/2 flour mix to butter mix. Add rest of flour mix. Add rest of milk. And add lemon gratings. Line a loaf pan with wax paper. Bake in a preheated 325 degree oven for 45-50 minutes, or until inserted toothpick comes out clean. In the mean time, combine the lemon juice with the 1/4 cup sugar. When the cake is done baking, take it out of the oven, and pierce holes in it with a knife. Pour lemon juice/sugar mix over warm cake. Let sit. And try not to eat the entire loaf in one sitting. Enjoy! Mmm...that sounds so yummy and it looks even better! Thanks for sharing this recipe! Sorry to hear about Bigmama's passing ten years ago :( This recipe is an awesome way to remember her by and think about all the great memories :) Thanks so much for sharing. You had me at "lemon"! I loooooooove all things lemon! Thanks for sharing! I can't wait until the next phase of my diet so I can have carbs - totally making this! I made this loaf and placed it on my Homescreen to not lose it because it's fantastic!! Making it this week. Yummy!! HAPPY NEW YEAR! !